There are about 100 billion to 200 billion galaxies in the observable universe. For roughly 13 billion years they’ve swarmed around each other, colliding and merging, undergoing rapid star formation and suffering periods of drought, where no new stars are born. They range in size and shape from small, dwarf galaxies to the beautiful and graceful mid-range spiral galaxies to the gigantic and ancient ellipticals. The smallest, the dwarf galaxies, can be as small as 200 light years across and not much more massive than a star cluster. They contain as few as a hundred million stars and act as shepherds of most of the spiral galaxies we see today. The largest galaxies in the universe are the ellipticals. They are featureless collections of very old stars that range in shape from nearly spherical to highly flat and contains as many as a trillion stars. So an intriguing question to ask is, of all these giant galaxies in the universe, which one is the largest? What is the largest galaxy we’ve ever seen? The answer is this one: known as IC 1101. IC 1101 is located one billion light years away in the constellation Serpens, this is the largest galaxy in the known universe. It is enormous, it has a diameter of six million light years and a mass of over 100 trillion stars, with most of that mass in the form of elusive dark matter. IC 1101 is more than 50 times the size of the Milky Way and 2000 times as massive. If it were in put in place of our galaxy, it would swallow up the Large Magellanic Cloud, Small Magellanic Cloud, Andromeda Galaxy, and Triangulum Galaxy. The largest galaxy ever found compared to our galaxy ©Reddit. IC 1101 has spent most of its life colliding with other galaxies and owes its size to these collisions. Over billions of years, galaxies about the size of the Milky Way and Andromeda have been merging together to sculpt and shape this titan of the cosmos. This galaxy is bereft of star making gasses, here rapid star formation has long ago ceased. Because of the lack of gas and dust, very few new stars are being born. Instead, those that remain provide the only source of fuel for their progeny when they die. IC 1101 is slowly eating itself to death. Through a telescope, in contrast to the blue-tinged spiral galaxies, IC 1101 is yellow-red in color. The color of a galaxy says a lot about the stars it contains: blue galaxies are alive and vibrant with new stars, while the yellow-red tinge ellipticals signals almost none. 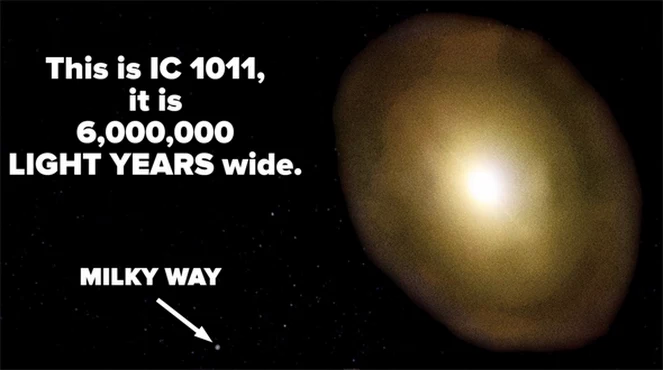 IC 1101 the largest galaxy in the universe in colors ©Youtube. IC 1101 and other ellipticals contain at its center, a supermassive black hole. It is commonly understood that the mass of a galaxy’s central black hole is tightly linked to the size of the galaxy, making the one at the center of IC 1101 the largest known supermassive black hole. This galaxy is dying a slow death. While not entirely devoid of new stars, unless it continues to merge with newer, younger galaxies, IC 1101 will slowly fade to oblivion. Galaxy collisions and mergers are pulse of the universe, with each one, galaxies are pollinated with new seeds for more stars, keeping them vibrant and young. Over time however, these collisions take their toll, the central supermassive black holes devouring all they encounter and leaving behind the shells of ever aging stars. We live in a universe teeming with activity, galaxies swarm around each other in a symphony of possibilities, each interaction sparking new life and new energy. If some theories prevail, then our universe may be about 2 billion years away from the halfway point in its life. As our Milky Way galaxy participates in this great cosmic dance and collides and merges, morphing from spiral to elliptical and ultimately sharing the fate of IC 1101, it will preside as a venerable statesmen over the Great Rip — the untimely death of our universe. Wow!! This is really overwhelming!! None fiction can overcome this reality. Peoples could have been find its knowledge only in the science magazine . But the have been never seen or reach it in their life . It’s a dream for all while it is true .